The Napoleonic Wars are raging in Europe. British manpower is stretched to its breaking point. Nearly 6,000 American sailors are taken against their will under the policy of impressment and forced into service in the British Navy. Trade restrictions are imposed on America that impedes trade with France. America responds with embargoes that hurt the US more than Britain. On June 18, 1812, America, for the first time, declares war on another nation—the United Kingdom. The congressional vote is the closest vote to declare war in American history. The War of 1812 begins and the young democracy is put to the test. Go to this site http://www.pbs.org/wned/war-of-1812/the-film/ to watch the film on your computer. Jacob Foreman was born March 18, 1793 in Mercer County, Kentucky. He was the third son of David and Elizabeth (Eli) Foreman the immigrant ancestors. David Foreman died in 1811 in Mercer County, Kentucky. This Jacob Foreman is my 3rd great grandfather, not to be confused with his son, Jacob Foreman my 2nd great grandfather who is the subject of my Civil War Blog. On November 10, 1814, Jacob Foreman joined George McAfee’s Company of the Kentucky Detached Militia under the command of Lieutenant-Colonel Gabriel Slaughter. The company marched south to Louisiana to fight in the Battle of New Orleans. State of Kentucky – Soldiers of the War of 1812. From my research on the War of 1812 and the history of George McAfee’s Company I have copied several articles of interest that reflect the conditions and times that Jacob Foreman served. I have an account written by a captured British officer. The portion of the line that he faced was manned by the militia forces of Kentucky. As the troops advanced on the American line, I with several of my peers of equal or lesser rank, stood upon a small rise on the field watching the men move forward. Observing the American defenses we saw a tall slender man standing alone atop the parapet. He was dressed in buckskin attire, with a wide brimmed hat that hid his face. Still beyond the range of our most forward ranks, he stood there fully exposed without fear, accessing the field. Finally, he pushed his back off of his head and raised his weapon to the firing position, and pointed in our general direction. This action initiated a laugh from our group as the distance was so great the result could only be a fruitless waste of powder. A plum of smoke exhaled from the rifle barrel. Seconds passed and our laughter continued until a thud was heard over the chuckles. Looking around at my companions, it was noticed that a young Lt. to my immediate left was shot through the chest, and slowly crumpled to the ground. All eyes turned back to the hunter, only to see him obscured by another plume of smoke, and just as soon another of our number fell. We looked for cover, but the ground was devoid of any, and in the few seconds it took to realize this fact another of my peers was down. Our only action was to mingle with the advancing forces, and in all my years as a soldier, I had never welcome the danger of battle, as the smoke and dust hid me from the view of that frontier hunter. Note: Originally published in book form by The Kentucky Historical Society, Frankfort, 1915. “Of this little force all but the eight hundred and eighty-four regulars were raw militia. Opposed to them, altogether, stood about eighteen thousand men, nearly all of whom were regulars of the British army, or marines of the British navy — the best trained troops then on the globe. The ironic twist to this battle of New Orleans is the Treaty of Ghent, ending the war, was signed two weeks before this battle. The battle of New Orleans lasted about 25 minutes. Shortly after Jacob Foreman returned home in 1815 his mother the widow Elizabeth Foreman inherited land in Highland County Ohio from her brother George Horine. Elizabeth and seven sons with their families left Mercer County, Kentucky for Highland County, Ohio. Her daughters and their families stayed in Kentucky. Jacob Foreman married Margaret Briggs in Buford, Highland County Ohio, and by 1851 Jacob and Margaret settled in Time, Pike County, Illinois along with several of his brothers including older brother David Foreman who also served in the war of 1812. David Foreman and his mother Eli Foreman are buried in the Blue River cemetery in Detroit, Pike County, Illinois. 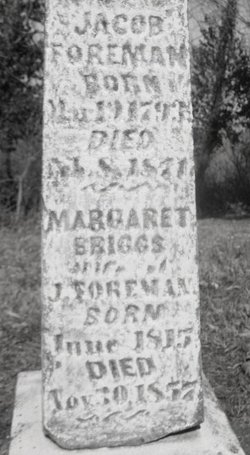 Margaret Briggs Foreman died November 30, 1857 and Jacob Foreman died February 8, 1871. Both are buried in the Time cemetery along with their son George, daughter Elizabeth and young son Alexander. When I visited the Time cemetery I couldn’t find their headstone but Kathy Robinson a Pike County genealogist was kind enough to send me the picture of the headstone posted above when she was searching the cemetery for veterans of the War of 1812. 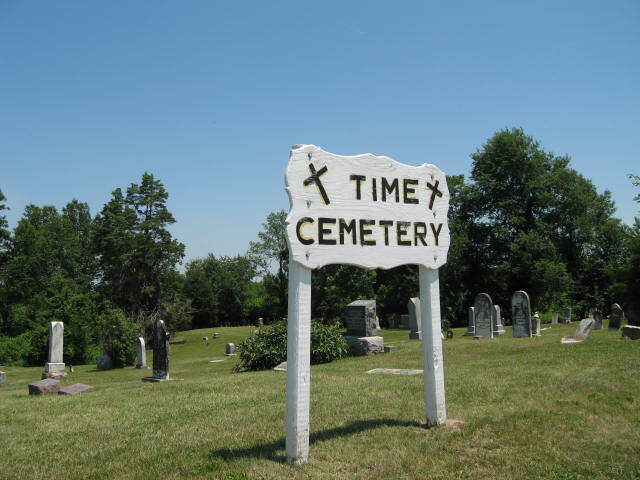 In 1878, Jacob and Margaret Briggs Foreman’s son Jacob and his wife Sarah Elizabeth Watt with 5 children, Mary Belle, Robert Sidney, Nora Kate, Arte Mesa and Martha Jane left Time, Illinois, traveled to Kansas and unable to find a home there settled in Coloma, Carroll County, Missouri. Martha Jane died in 1879 in Kansas. She was 2 years old. In 1887 the family, including William Turner, John Everette and George Edwin who were born in Missouri, moved west to Vernon, Colorado, just 10 miles south of Wray in what was Arapahoe County and is now Yuma County. Remember the Johnnie Horton song – The Battle of New Orleans? And we caught the bloody British in the town of New Orleans . . . This entry was posted in Family History and tagged Battle of New Orleans, Elizabeth Foreman Margaret Briggs Foreman, Foreman Family History, Gabriel Slaughter, George McAfee, Highland County Ohio, Jacob Foreman, Kentucky in he war of 1812, Kentucky sharpshooters, Mercer County Kentucky, Time Pike County Illinois, Vernon Colorado, War of 1812. Great article! I am impressed by the amount of research you have done on Jacob’s war service. It is an informative & interesting post!